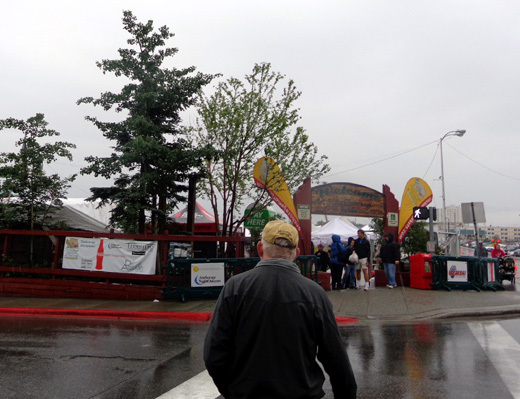 This entry is mostly verbatim from my daily Alaska journal and covers some of our activities for the last two days, which have been rather wet -- the downtown Anchorage farmers' market, some retail shopping, new hiking shoes, a joke on us re: a camper repair, the Crow Pass Trail Marathon, an interesting reason for the closure of a trail, a new awareness of various issues routinely facing Alaskans, and more. I hope some of the information and insights will help other travelers and/or entertain our readers. 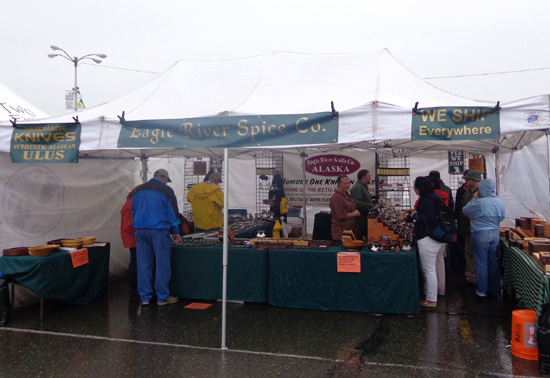 If you go to Alaska, consider buying a traditional ulu knife for yourself or a gift. Just be sure it's really made in Alaska and not China! To be honest, we were both ready for a couple of more restful days. We've been busy since we got to Alaska and we aren't 35 any more . . . 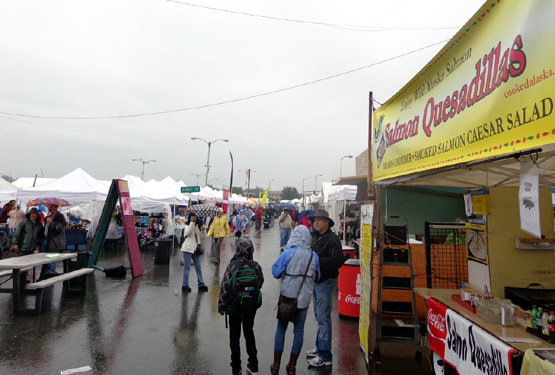 Most of the pictures in this entry are from the large Anchorage farmers' market. 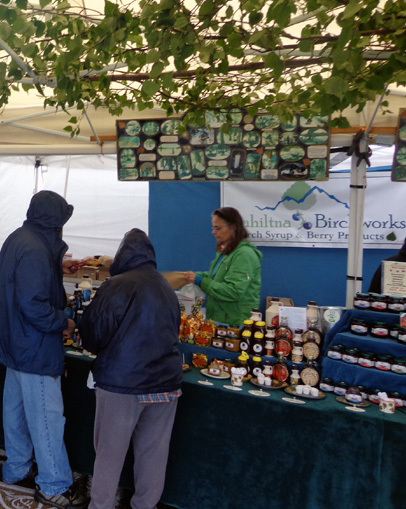 We always enjoy browsing farmers' markets as we travel around the continent. Although today was cooler (low 60s F.) and rainy off and on, we got out and made the best of it. A little before noon we went to PetSmart and Target at a shopping center just out the Muldoon Gate of Joint Base Elendorf-Richardson (JBER), then headed downtown for the weekly farmers� market across from the Post Office on Third Ave.
We drove around a while before lucking into a good parking spot just two blocks from the market. Parking is free downtown on the weekends. I was surprised how many people were there on a rainy day. 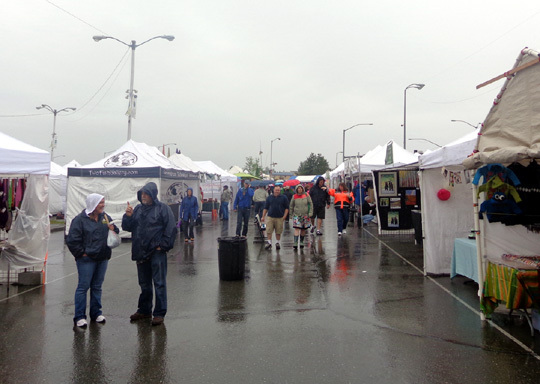 A little rain doesn't keep Alaskans inside and it shouldn't deter visitors from getting out, either. Free samples in a dry booth draw in potential customers. 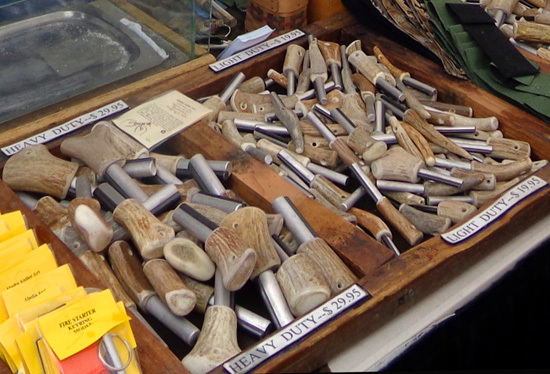 There were some interesting Alaskan-made tools (all sorts of ulus and other knives, fire starters with handles made from antlers, etc. 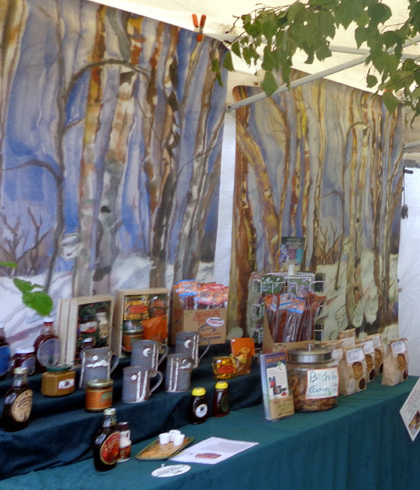 ), beautiful nature photographs in several booths (they always inspire me re: composition and subjects for my own photos), soft hand-knitted qivuit accessories (still out of my price range), attractive wooden burl bowls, salmon and other fish products, berry products, baked goods, fresh veggies, lunch items, etc. 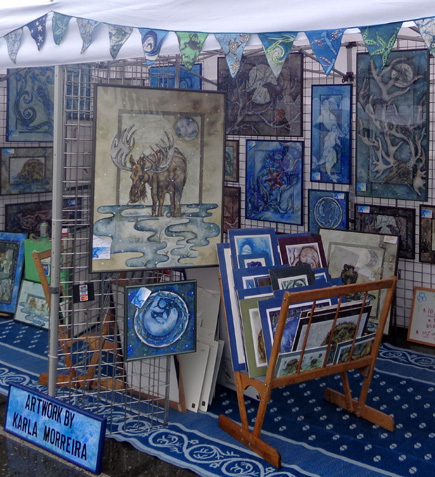 I was hoping to find some hand-made birch baskets but didn�t see any to purchase. Our next step was REI. The Anchorage store is as big as any we've been to in the Lower 48 states. I spent a while looking through a book filled with beautiful pictures taken during all four seasons at nearby Chugach State Park � more inspiration for photo shots and places to hike up in those mountains on the eastern boundary of the city. I checked for sales-priced convertible pants (the kind we like with zip-off legs) in both the men�s and women�s departments � none available except regular price so we didn�t get any. Those are great for hiking and casual living. I tried on several pairs of trail running and low-cut hiking shoes because the forefoot mesh is torn on the Asics trail runners I've worn at least 500 miles. I was looking for something a little beefier since I'm doing a lot more walking than running these days. Shoe weight isn't as much of a concern to me now. The pair that was the most comfortable was the Moab Ventilator from Merrell in a nice subtle "walnut" (brownish gray) color that should hide dirt well. The Ventilators look like trail running shoes but are sturdier and have more tread than any trail running shoe I've had in the last 30+ years. 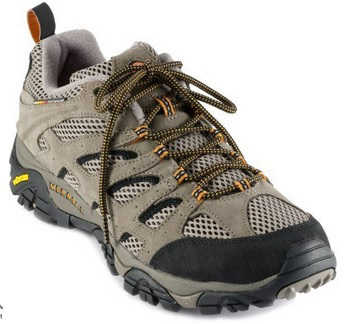 They are still very light weight compared to more traditional hiking shoes, however. The Merrells have less mesh in the forefoot than my old Asics shoes but they look like they will breathe and drain well. Guess that's why they got the name "Ventilator," eh? We also shopped for salmon. Carrs-Safeway stores have fresh filleted sockeye salmon for only $9.99/lb. again ($17.99 if you don�t have a Safeway card) so we got another 3� pounds. Although there aren't very many king salmon returning to Alaska's rivers this summer, there are apparently enough sockeyes to satisfy all of the competing interests (commercial, sport, and subsistence fishing). We�d like to get some halibut but it was $22/pound at that store; we decided we didn't want halibut that much. I don't know if that's a typical price or if it is in short supply this year, driving up the cost. We�re pleased to see diesel prices down (ha!) to $3.99/gallon at JBER and some other stations in Anchorage now, too. That's still above the average in the Lower 48, thanks to transportation costs. It's so ironic that the Alaska Pipeline sends oil from up here to processing plants farther south, then has to be shipped back up here at great cost . . . This morning there was a trail marathon from Girdwood to Eagle River on the historic Crow Pass Trail, which is 24 or 25 miles long. 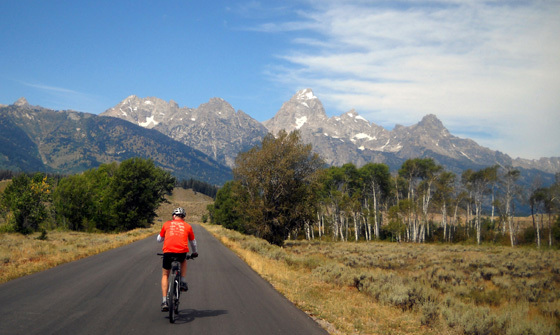 Here's an interesting article I found online about the Crow Pass Crossing race. I bet some of our ultra-distance trail running friends would enjoy that race or doing a training run on the trail. Matt, Anne, and Sandy could go out and back from either Eagle River or Girdwood and easily get in 50 miles . . .
I�d like to hike a few miles of that trail out and back from Girdwood because it�s closer to the pass from that end. I like to get up high so I can get better views. As long as the trail isn't buried in snow I know I could do the 3,800-foot gain to the pass from the southern trailhead. If I was still able to run I know I could do the whole Crow Pass Trail one or both ways in a day (especially since there are so many hours of daylight in Alaska in the summer). It's frustrating to know that I can't cover nearly as many miles any more since I have to resort to just walking. 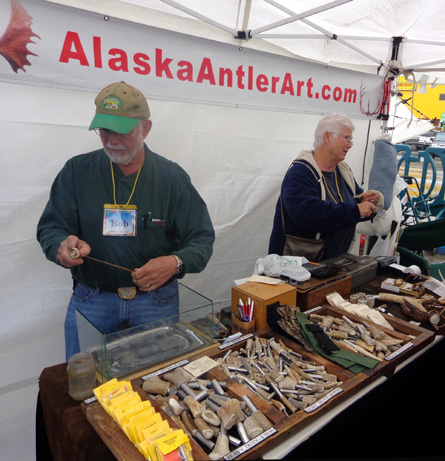 I doubt I�ll drive down there from Anchorage this summer but it�s something I�ll consider if we come back another year and are camped closer to Girdwood, like at Williwaw Campground. From the film footage on the evening news the Crow Pass Trail looked like a muddy mess today. Part of the trail was closed recently because a grizzly bear was aggressively defending a moose it took down. Obviously it�s open again now. I mentioned recent Alaskan road closures that occurred for some unusual reasons in the last entry -- a vehicle hijacking, a suicide-by-cop attempt, a motorcyclist killed by a moose crossing the road . . .
Now I've heard of a rather unique reason to close a trail, unusual at least to someone who doesn't live up here. For all I know it might be a regular occurrence in Alaska. We're definitely not in Kansas any more, although grizzlies probably kill moose in Montana, too. Not sure what other states in the Lower 48 have both grizzly bears and moose living in the wild. I'm pretty sure Kansas doesn't have either one . . .
Today I did more photo editing and read more about things to do in the Mat-Su Valley, Denali area, and Fairbanks. 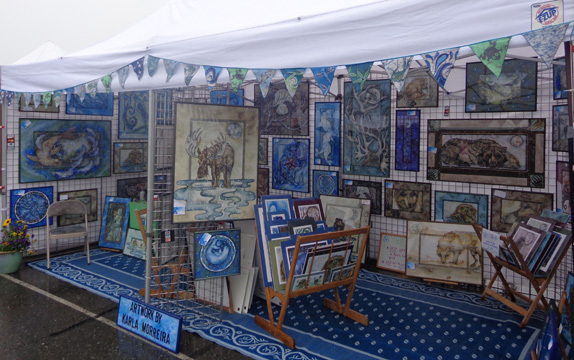 We are going to pay for another week at this campground in Anchorage, especially since it�s mostly rainy this week. We�re a lot more comfortable here at JBER and in the city when it�s cool and wet than in an unfamiliar area, probably without full hook-ups. It's easier to keep the camper warm and dry with electricity than propane. Besides, we're starting to feel kind of "at home" here! If there weren't so many other interesting places yet to see, we'd be happy staying in Anchorage the rest of the summer. Temperatures ranged from the low 50s to 60 F. today, with some rain in the morning. I spent most of the day inside the camper but took Cody for two walks around the campground. I read a lot of information about things to do and see between here and Denali NP and narrowed down our choices of places to camp. We made reservations online at two campgrounds in the park 'way back in December, the only advanced campground reservations we made for our Alaskan adventure. We're winging the rest of it. Since we've decided to camp here at JBER at least another week I made a list of more things I want to do in the Anchorage area, too. We'll still have several days to check out things between here and Denali before we're due at the park on August 5. 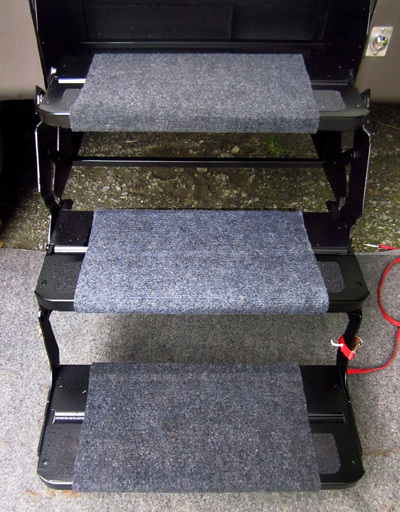 Steps that come on most travel trailers and 5th-wheel campers are not all that sturdy. 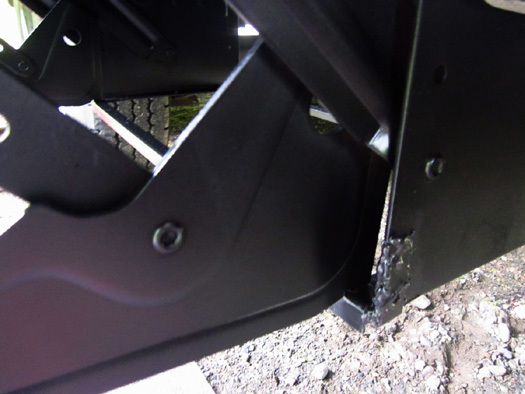 With many of today's RVers being overweight, lots of folks have problems with their steps and need to repair, reinforce, or replace them well before other over-use parts issues arise. Jim and I are not overweight and we don't bounce in and out of the camper like younger folks do -- yet we still have problems with the steps. Jim checked at the auto hobby shop on base yesterday and found out they have staff who can do welding and they are open on Sundays. 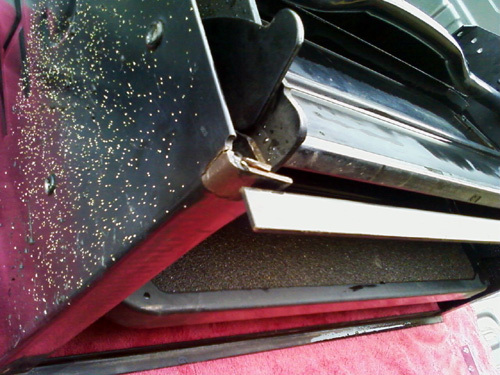 This morning Jim went to Lowe�s first to get some extra pieces of metal to use for reinforcement. 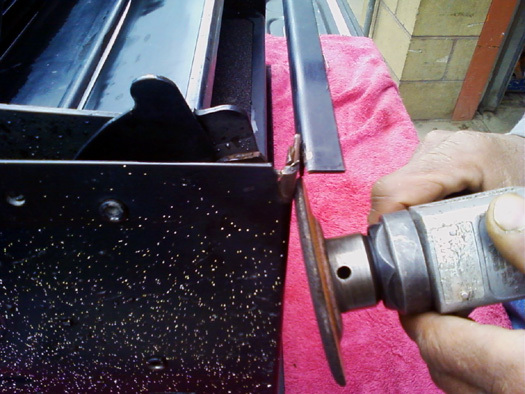 The welder picked what he thought would work best and Jim returned the pieces he didn�t need. OK, now where can I paint this thing? 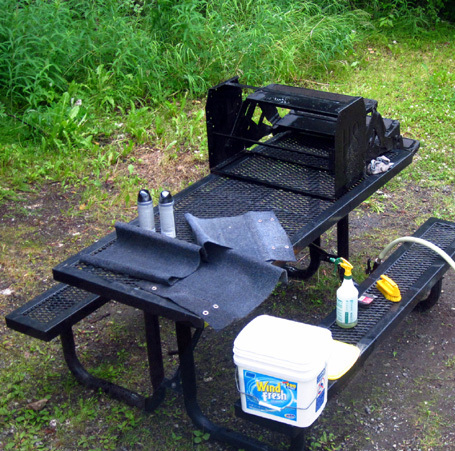 Ah, perfect -- the picnic table is black metal, too, and it could probably also use some new paint. 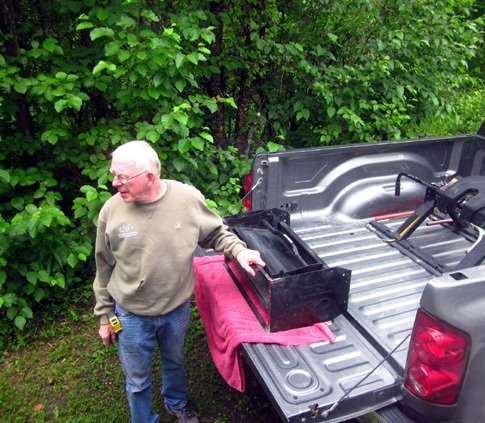 When Jim got back from welding this morning he put the steps on the picnic table at our site, painted the whole step mechanism with black spray enamel, let it dry partially, reinstalled it on the camper, but kept it closed so it could finish drying before we began using it again. Cody's so adaptable he barely noticed our temporary steps. 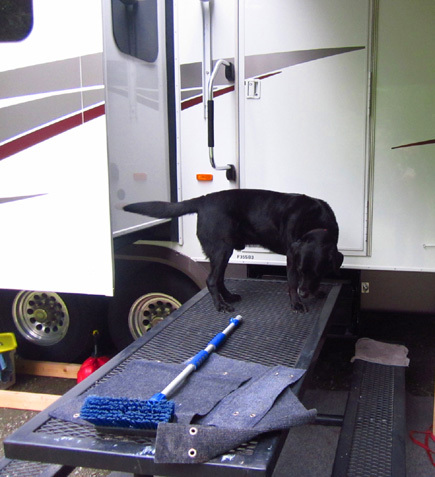 Cody and I stayed inside several hours while the steps were off because it was too much distance from the camper to the ground for me to maneuver more than once -- getting out hurt my knees and getting back in hurt my shoulders -- and I couldn�t lift 75-pound Cody in and out safely. Guess that's sort of another "cautionary tale" from Sue and Jim. We should have borrowed someone's step-stool or found an easier way in and out for Cody and me long before we thought to move the picnic table in front of the door. We were fine, though, and I got a lot done during my temporary confinement inside the camper. Before bedtime Jim tested the paint to be sure it was dry. We put the wrap-around carpeting back on each step and returned the picnic table to its spot about 15 feet from our door. Wonder what that repair (or new steps installed) would have cost if Jim wasn't handy enough to do it himself? The welding job was free. Our only costs were for the paint, a piece of metal reinforcement, and diesel to get to Lowe's and the auto hobby shop. The bunchberries AKA dogwoods are also starting to lose their pretty white blossoms. 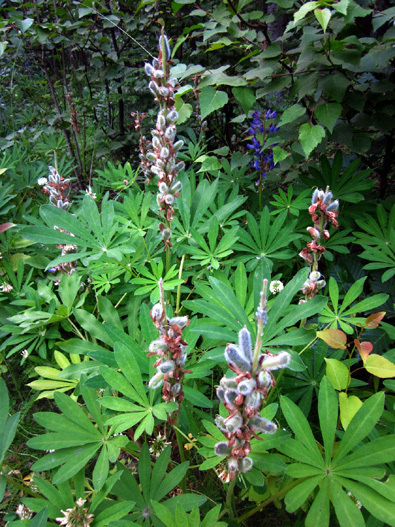 Clover and cow parsnips are blooming all over town now, while fireweed has yet to peak in the Anchorage area. I enjoy watching the succession of flowers no matter where in the world I am. Since we've been in Alaska I've developed a new awareness of various "conflicts" that routinely affect residents here -- bears vs. humans in urban areas, mining and oil exploration vs. environmental concerns, subsistence fishing traditions vs. commercial and sport fishing interests, and other issues that either don't exist in other states or are less common. 2) the high state of dependency Alaskans in general have on food from out of state, how easily the food supply can be disrupted when roads are closed, and how rapidly food costs are rising. Some of the five types of salmon found in Alaska are as plentiful as usual this summer. An illustration of the first case, known as subsistence fishing, is the recent arrest of some indigenous people for catching king salmon after the Fish & Wildlife Dept. specifically told them not to. That raised quite a hullabaloo in the remote fishing villages that are particularly dependent on those fish for their main food supply. The issue is a political football this summer, with traditional Native "rights" and their short-term needs pitted against protecting the resource for everyone for the long term. Simply put, if enough king and other kinds of salmon aren't allowed to spawn upstream this year, there will be even fewer salmon three years from now (their life cycle is three years from birth to living out in the ocean to their return to their birthplace to spawn and die) and eventually they could become extinct in Alaska. That's no good for people or fish. 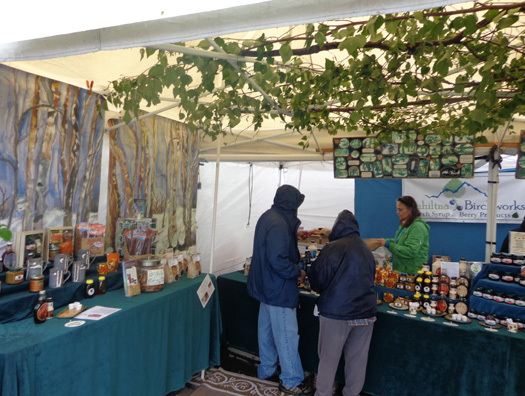 there weren't many fruits and veggies for sale at the farmers' market this weekend. 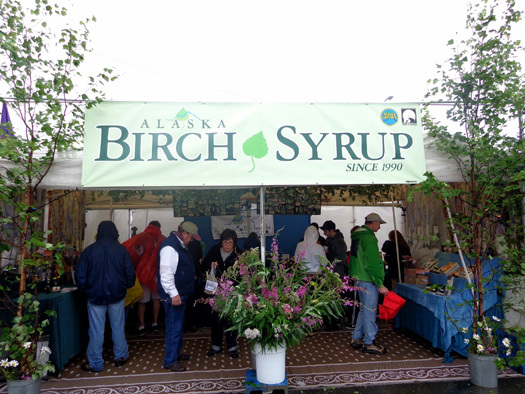 In the second case, Alaskans can grow many of their own foods but they are limited by an extremely short growing season and lack of production facilities in the state. They are very dependent on other states and countries for most of their food (and other products, too). Transportation costs by land, sea, and air are becoming increasingly expensive, driving up the cost of "imported" food and other necessities. And when the highways that are used to transport those goods are closed for one or more days, well, stores may simply run out of perishables and other items. That was an eye-opener for us when we got stuck in Watson Lake, Yukon Territories last month for five days because the Alaska Highway -- the main land artery in and out of Alaska -- was closed in several places because of washouts. I never thought about most of this until being up here in the Far North and reading/hearing about these issues. I've got a whole new level of respect for the people who call Alaska home -- northern Canada, too.